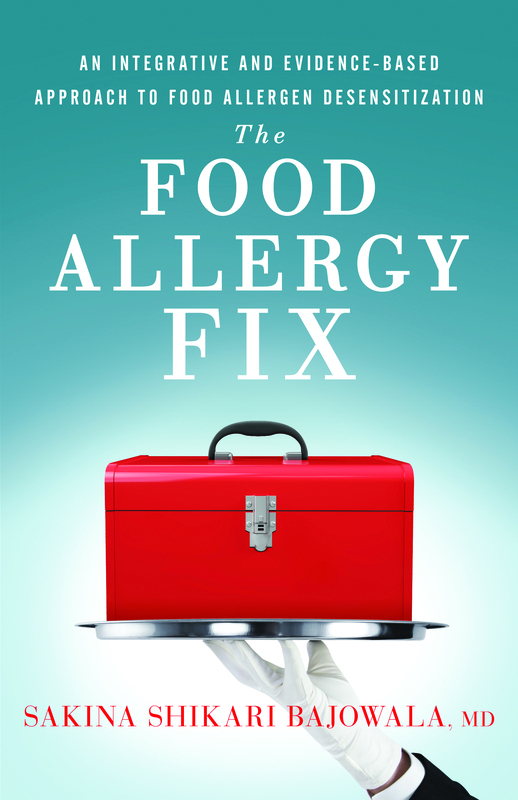 This is a long-overdue book, not in the sense that library books are kept too long but because it brings us up to date on the still-unapproved, yet widely available, treatment called oral immunotherapy (OIT) for food allergies. We have been following the progress of OIT on this website for years since before we published a piece by Dr. Hugh Sampson with the subtitle “Not Ready for Prime Time.” It attracted so many hits that it crashed the site, which remained out of commission for a nervous weekend while we tried to reach our developer in Sri Lanka. 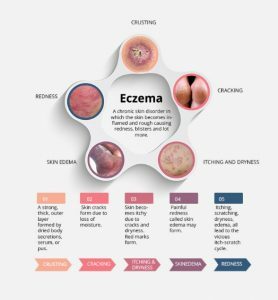 In the intervening years, we have seen such developments as AR101 (a prescription oral immunotherapy being fast-tracked to market), and other immunotherapies such as sub-lingual (SLIT), epicutaneous (EPIT), and even toothpaste (oral mucosal immunotherapy, or OMIT), as we reported recently. 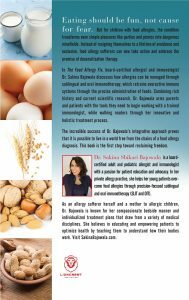 Many patients will no longer be restricted to eternal vigilance as a food allergy strategy, although they will have to continue to carry their epinephrine. In the meantime what I used to call the OIT underground has continued to percolate and proliferate. Dr. Bajowala makes a strong case that it is ready for prime time. But not on network TV! This is premium cable, and with the publication of this book, Sakina becomes the HBO of private practice OIT by taking us inside the history and methodology of her work. She describes the processes both of sensitization and desensitization, and creates a detailed blueprint of how an OIT practice should function, highly individualized and flexible, right down to strategies for educating children on their responsibilities. She believes that prescription immunotherapy (call it basic cable) will leave many patients behind, although it will be offered by more mainstream allergists. Sakina herself might have chosen the standard route, but for the fact that her own children turned out to be food allergic and she wasn’t going to take it lying down. She studied the scientific literature, but as a mother she wasn’t content to wait and began poking around the protocols being pioneered at the time. 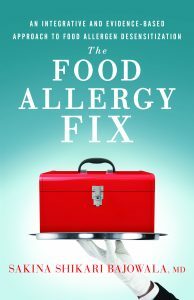 Despite the emotional underpinnings of this journey, she is never anything other than information-driven and analytical about the brand of medicine she offers her patients, starting with the careful choice of title The Food Allergy Fix. This is a fix, not a cure, and some patients may not be fixable. Moreover, it does nothing for co-morbid conditions like asthma and eczema, which often constitute greater threats to quality of life, and in the case of asthma to life itself, than food allergies. One thing that really captured me about Dr. Bajowala’s approach was her emphasis on the importance of digestion. Food allergies are a condition of the digestive system as well as the immune system. 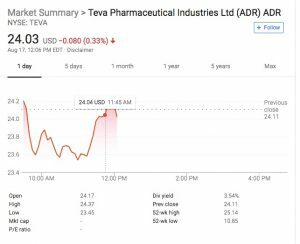 In the early days of private OIT I heard about even very young patients being given antacids and proton pump inhibitors to keep their gorge from rising, and give the allergen time to engage their immune systems. To caregivers and doctors, the prospect of eventual tolerance was worth the risk of short-term discomfort and, as it turns out, long-term damage. The other doctor I know for whom digestion is given equal weight is my co-author Dr. Xiu-Min Li whose practice, centering on traditional Chinese medicine (TCM), embraces a category of patients who have suffered chronic gastric distress from OIT. She and Dr. Bajowala collaborate on some patients. 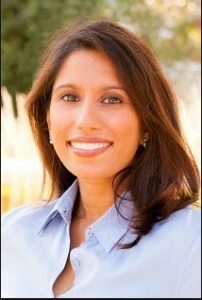 Dr. Bajowala’s approach is based on the other great Asian medical tradition called Ayurveda, which to my dim Western eyes places even more emphasis on digestion than TCM. The one lecture I heard about it by a prominent allergist contained more references to poop in 20 minutes than you would hear from a typical eight-year old boy. 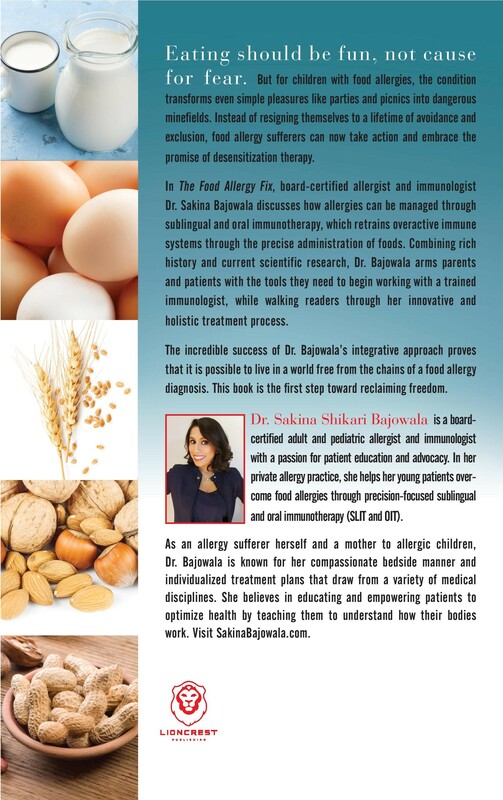 The point being for purposes of Sakina’s book is that it provides an accessible and practical roadmap for the forgotten side of treating food allergies that should be required reading for OIT practitioners current and aspiring. OIT is not for all allergists and not for all patients. Neither group should feel pressured to undertake it without full understanding of commitments and risks involved. A recent retrospective study of 270 patients aged 4-18 showed that 79% were desensitized to peanut, although there were epinephrine-treated reactions in 63 patients and isolated gastrointestinal symptoms in 101. Seventy-nine percent efficacy is not too shabby; many approved drugs have lower efficacy rates. But those results also leave some questions unanswered. That study was just for peanuts, the best-studied allergen; others, notably milk, can be trickier, and remain to be similarly studied. In a real-world setting, will patients be properly screened to see if they are allergic or will non-allergic patients be counted as successes? And with all OIT the prospect of maintenance dosing poses an unending dilemma. Medication fatigue is a challenge with all chronic disease management, although it can be more bearable if taken in the form of pizza and ice cream, as Dr. Bajowala points out. The food allergy epidemic will continue to prod doctors and patients in the direction of action. This book, written with warmth, authority, and good humor, will help both figure out where they stand. So, well done, Sakina. To buy this book on Amazon, click here. For a short time the ebook will be $.99. After that it will be $7.99 for ebook, $15.99 for paperback. Anyone with fond memories of carefree walks in the woods is hopeful that effective treatments can be found for Lyme Disease, also known as Lyme borreliosis, an infectious disease caused by Borrelia-type bacteria of the which is spread by ticks. In keeping with the theme of Integrative Medicine, the East West Conference will present two speakers on this subject. 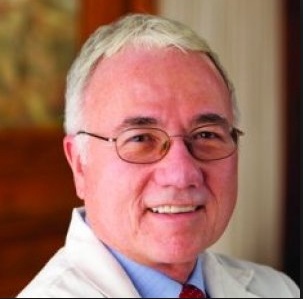 The first is Dr. Raymond Dattwyler MD of the Division of Clinical Immunology, Allergy, and Rheumatology at New York Medical College, the host institution. His research aims to develop new diagnostic tests for infectious diseases, including Lyme disease. These new tests will lead to earlier diagnosis of Lyme disease and enable prompt treatment that may prevent the development of serious symptoms, such as arthritis and neuroborreliosis. With funding from the NIH, Dr. Dattwyler’s group is working to develop new diagnostic tests for a number of infectious diseases, including Lyme disease. The new Lyme tests are designed to fill the gaps that exist in testing today, particularly for the early diagnosis of Lyme disease. 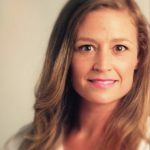 The second speaker Mary Deminie, is a Licensed Acupuncturist in the the state of New York, with a concentration in Classical Acupuncture. Mary is accredited by the National Certification Commission of Acupuncture and Oriental Medicine (NCCAOM) as a Diplomate of Acupuncture (Dipl. Ac. 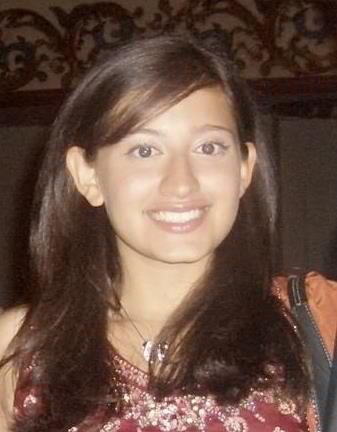 Her clinical experience includes: NYU Langone’s Initiative for Women with Disabilities. Pertinent to her place on the July 15 program, she also received certification under Heiner Fruehauf, Ph.D., L.Ac., founding Professor of the College of Classical Chinese Medicine at the National University of Natural Medicine, in the study of eastern herbal treatments for parasites, or Gu Syndrome, specifically Lyme Disease. Dr. Dunkin will review the state of TCM treatment and research with Crohn’s, EoE and other non-IgE mediated diseases. 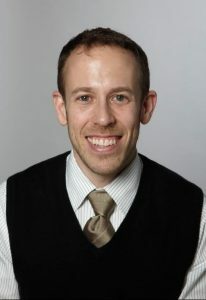 David Dunkin is a pediatric gastroenterologist at Mount Sinai who works mainly with young patients suffering from inflammatory bowel disease, such as Crohn’s disease and ulcerative colitis. These are immune-mediated diseases that share symptoms—abdominal pain, rectal bleeding, diarrhea, weight loss, fever, and joint, skin and eye involvement. In addition, when clinicians have trouble distinguishing between them, they use the term “indeterminate colitis” and “IBD undetermined” in referring to it. Dr. Dunkin says that Crohn’s children are often easy to spot because they are characteristically pale, thin, below average in growth, and malnourished all in the setting of the symptoms described above. 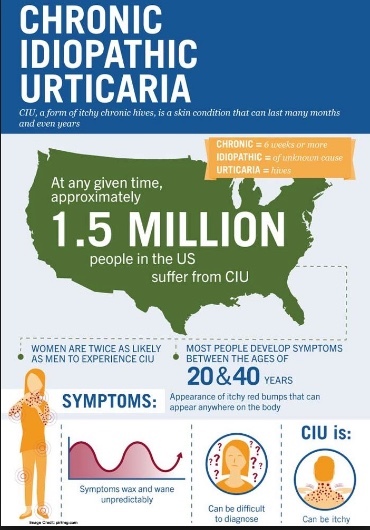 Crohn’s disease affects 1.4 million Americans, 140,000 under the age of 18. Approximately 25% of all new cases in the population are under 20, and roughly 30,000 new patients are diagnosed annually. Remarkably, the incidence is increasing in the western world especially in children under 10 years old. Treatments include corticosteroids, enteral feeding—liquid diets fed through a tube into the nose—and monoclonal antibodies. They can have serious side effects, especially for child growth and development. Dr. Dunkin treats patients in an IBD Center at Mount Sinai. A team approach includes adult and other pediatric GI specialists, nutritionists, surgeons, nurses and nurse practitioners, a social worker and two nutritionists. 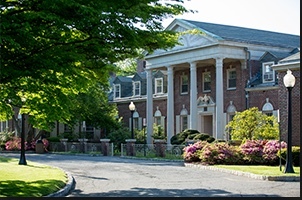 The center is also involved in clinical trials in some of which Dunkin is lead investigator. 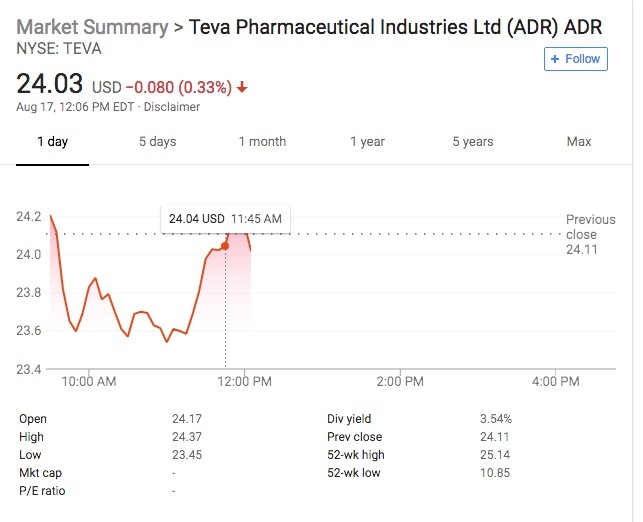 Dr. Dunkin began working with Dr. Xiu-Min Li when she noticed that her food allergy herbal formula [FAHF-2] inhibited production of tumor necrosis factor alpha (TNF-a). High levels of TNF-a were also associated with Crohn’s disease. TNF-a increases the transport of white blood cells to inflamed sites where they spur the secretion of tissue-degrading enzymes, causing the damage that can be seen through endoscopy. 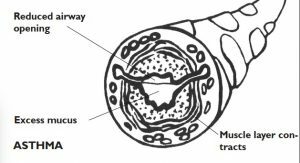 High TNF-a levels are found both in the serum and the inflamed mucosa. Serum levels of the cytokine have been shown to align with clinical and laboratory indices of intestinal disease activity. 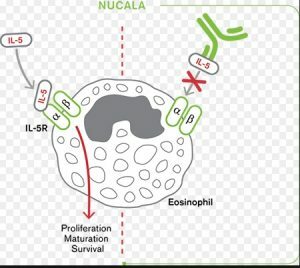 Infliximab, a monoclonal antibody that inhibits secretion of TNF-a, is the first effective biological therapy approved for commercial use. Dr. Dunkin and his co-authors have written that monoclonal antibodies have “revolutionized” treatment of Crohn’s. However, he cautions that monoclonal antibodies have significant side effects and financial costs. 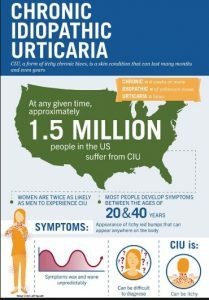 For IBD, treatment involves lengthy infusions in hospital facilities at an annual cost of $30-40,000. “What we really need is a pill,” Dr. Dunkin says. A survey at the IBD center at Sinai showed that most patients and parents were open to complementary and alternative treatments. Dunkin’s work with Li thus was conducted in a highly receptive environment. Their first study showed that FAHF-2 has immuno-regulatory effects on human peripheral blood mononuclear cells (PBMCs) and mucosal tissue from Crohn’s subjects and in a murine model of colitis, affecting both the adaptive and innate immune systems. FAHF-2 inhibited TNF-a production by PBMCs and mucosa of CD subjects by both monocytes and T cells, suggesting that FAHF-2 targets pathogenic cells secreting in?ammatory cytokines. Besides targeting specific pathogenic cells producing TNF-a, FAHF-2 modulates many of the inflammatory cytokines shown to be elevated in CD. 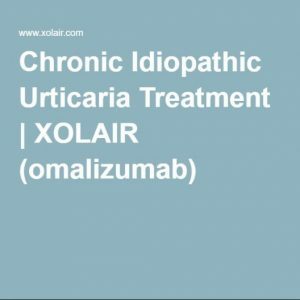 That suppression of IFN-a for Crohn’s patients is particularly interesting because among food allergy patients, it is too low and needs to be increased, which is exactly what happens when treated with FAHF-2, the same compound. This indicated that FAHF-2’s immuno-modulatory effects vary depending upon the illness. Given the multiple effects, FAHF-2 may indeed be superior to single target medications like monoclonal antibodies and without the side effects seen with corticosteroids and other broad immuno-suppressants and monoclonal antibodies. Anne says that there’s a feeling in medicine that “if you can’t test for something, it doesn’t exist.” The time pressures of doctor-patient interaction compound the dilemma. 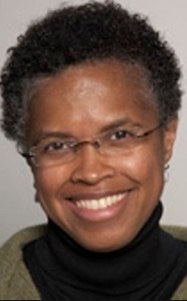 “Neglecting patient stories has created a desert in which snake oil finds a niche.” By 2013, Maitland had begun to develop a reputation for diagnosing and treating mast cell disorders, after seeing a number of patients with connective tissue disease, but for whom data didn’t support a diagnosis of typical food allergies or of mastocytosis. In these patients, the skin, the gut, and the lungs, where the body confronts the environment, were all reactive. Today, Dr. Maitland is a prominent authority on mast cell disorders in private practice in Tarrytown, New York who has referred many patients to Dr. Xiu-Min Li, and is scheduled to join Dr. Li as a regular consultant in her clinic in Mamaroneck, New York. This is the third conference I have been associated with and I’m excited. The series is the brainchild of Dr. Xiu-Min Li whose scientific mission over many years has been to adapt traditional Chinese medicine (TCM) to treat immune disorders that have stubbornly resisted mainstream medical solutions. Among the speakers who will be familiar to readers of this website are Scott Sicherer, MD from Mount Sinai, Wayne Shreffler, MD of Mass General, Purvi Parikh, MD, and Dr. Li herself. Less familiar are Er-Ping Xu, MD, Professor, President of Henan University of Traditional Chinese Medicine; Charles Emala, MD, Henrik H. Bendixen Professor of Anesthesiology; Vice Chair for Research, Columbia University Medical Center; Jinhui Dou, PhD, Former FDA Botanical Review Officer; and many more. I am looking forward particularly to hearing Dr. Mazin Al-Khafaji, MD, and TCM practitioner who will discuss his experience with TCM for unusual/difficult diseases, including dermatological, autoimmune and allergic inflammation. He has something of a rock-star image among acupuncturists. 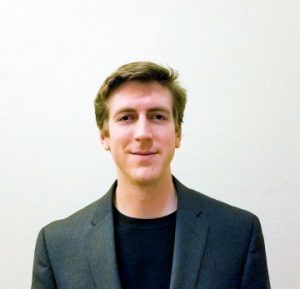 We are fortunate that he’s taking time from a busy teaching tour to join us. Anyone who fears walking in the woods might also be intrigued by Mary Deminie LAc, Founding Professor of the College of Classical Chinese Medicine at the National University of Natural Medicine who will speak on using TCM to treat Lyme Disease. Other conditions include asthma, bowel diseases, and mast cell disorders. 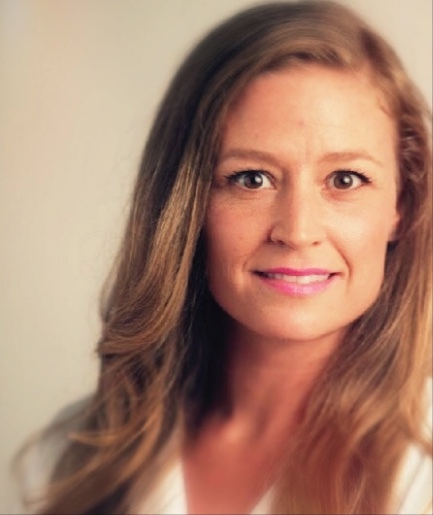 Beth White, a patient of Dr. Li, will describe her experience with Churg-Strauss and red-skin syndrome and integrative care for these conditions from a patient perspective. The day runs from 8:30AM-4PM. There will be complimentary breakfast and lunch available. There will also be an area to accommodate you if you bring your own lunch. Please email Tonta if you have any questions or need additional assistance. On May 8, I had the privilege of going to the nation’s capital to take part in an event sponsored by the Allergy & Asthma Network, which was founded by Nancy Sander with the help of Dr. Paul Ehrlich in 1985. The current CEO is Tonya Winders, and she is a dynamo. 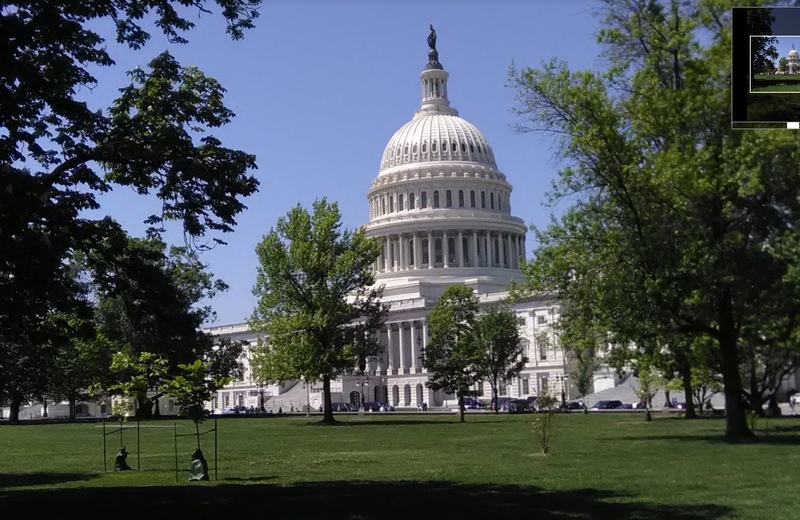 The two-day event consisted of half a day of blogger conference followed by a full day of our visiting visiting the offices of our Representatives and Senators to lobby on behalf of several pieces of legislation now before Congress. 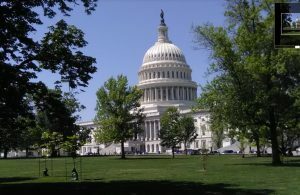 We were advocating for access to care, affordability, epinephrine in schools and on planes, expansion of allergen warning labels to include sesame, and other topics. One of the most impressive elements of the program was the emphasis on health care disparities. During a lunchtime session in the Capitol building between morning and afternoon lobbying, Dr. Randall Brown of the University of Michigan spoke to us about the gaps in care and disease levels by class and race. Bruce Bender, PhD, of National Jewish Health in Denver spoke about asthma among Native Americans, specifically his work on Navajo reservations. An Oklahoma mother underscored Dr. Bender’s point by speaking about the death of her teenage son by suicide after treatment for asthma with montelukast. The reservation doctor persisted with this treatment in spite of complaints about the boy’s mood disorders associated with its use; more conscientious physician would likely have put him on inhaled corticosteroids. 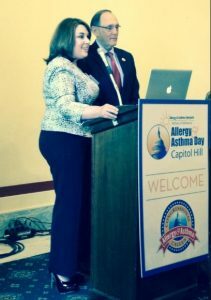 Bradley Chipps, MD, president of the American College of Allergy, Asthma & Immunology gave an overview of the state of allergy and asthma in the US. The New York group of which I was part included an allergist and a ten-year old boy who recently experienced his first episode of anaphylaxis on a flight from Aruba. The airliner didn’t have any epinephrine aboard, but he was rescued when two passengers came forward with their own auto-injectors. 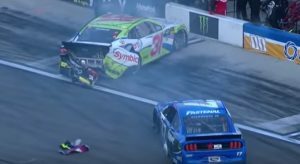 One failed but the other did the trick. In the morning, we visited the offices of Senators Kirsten Gillibrand and Charles Schumer where we met with aides. (The offices were so busy that we had to meet in the hallways.) In the afternoon we stopped at the office of Rep. Jerrold Nadler—we knew we wouldn’t be speaking with him because as we entered the CSPAN monitor revealed he was speaking on the floor of the House. Our last appointment was at the office of my own Congresswoman, the Honorable Yvette Clarke, where we spoke with a young aide who had both asthma and a shellfish allergy, but when he confessed to not carrying an auto-injector at that moment, he was hit from all sides. He said that he would not make that mistake again. 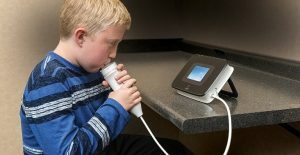 For more on Allergy & Asthma Network, click here.